Is the primary responsibility of a Buddhist to defend the historical teachings or to question them? Stephen Schettini recounts his harrowing quest for spiritual purpose as a struggle between conformity and integrity. Tibet House: Friday evening, April 09, 7:00 pm: Buddhism & What the Buddha Taught — Is There a Difference? Stephen Schettini took his Buddhism so seriously that after eight years as a monk, he quit his robes, his teachers, his fellow monks and his hard-earned fluency in Tibetan, slamming the door on privileged monastic life. Now, thirty years later and teaching mindful reflection to secular, stressed-out consumers, he makes a careful distinction between Buddha and Buddhism. He’ll talk about the difficulties of balancing faith with open enquiry, and the challenge of transplanting the Buddha’s message in the West. 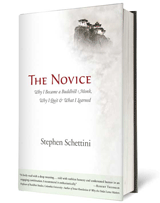 Stephen Schettini was a Buddhist monk for eight years. He studied in the Tibetan tradition and in Sri Lanka in the 1970s and early eighties and was trained to be a teacher of Buddhism to Westerners. He is director of Quiet Mind Seminars in Montreal and author of The Novice, How I Became a Buddhist Monk, Why I Quit and What I Learned, and of It Begins with Silence: The Art of Mindful Reflection.